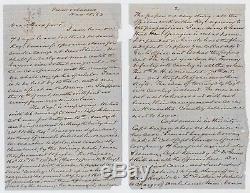 Civil War Letter 1863 162nd NY General Lewis Benedict KIA Louisiana WAR CONTENT. Four page letter plus envelope from Colonel Lewis Benedict to Captain William P. Two sheets of light blue paper. Each measures 5 x 8' with minor edge damage. We shall probably not move until the bayous rise so that our gunboats can co-operate with the army when we shall sweep LA of rebels. Texas is to be held by the 13th A. Until we can assist in undoing it. I suppose the 15th of next month will find us rising from our winter lair. The Reg't is improving. We had with 46 conscripts under Capt Johnson 256 men for duty on 10th. Our sick are being restored to strength daily and set 9 to the reg't since your departure nothing of much interest has occurred. We marched to Opelousas constantly threatened by the retiring rebels; once they promised to fight. The brigade 162d, 165th, 160th, 173d NY (the only pure NY brigade) was favored with the order of support Col' Davis' Cavalry. I moved up in a hurry examined the ground deployed the 165th as skirmishers and then after a few shots fired by the enemy we vamoosed and we were on appointed. After reaching Vermillion Bayou on our return Gen Lee Chief of Cavalry made a reconnaissance as far as Carrion Crow Bayou with about 1500 men. I was ordered to advance with the Brigade about a mile beyond V- & there be ready to support Lee. Trull's Battery reported to me. We obeyed orders and about an hour after taking position rec'd request from Lee to advance up road was met about 4m up by message that he was returning before superior force- and ordering me to take a position where my men would be masked so that he could turn around and make a dash at the enemy cavalry. I selected the east side of a prairie about 1200 yds wide-even in ditches. Nimm's Battery in rear of left flank & Trull's on right. I could have fought 5000 men with our 800, Lee retired behind one to coax the enemy under Gen. ___ out into the prairie but he was too foxy. He opened on us with artillery. We replied for an hour it was pretty hot especially for the Rebs. Then they got sick of the fun & retired after being foiled attempt to out flank us. Our men were so well protected that we lost only one killed (110th, & 4 wounded) 1 of ours. Since then it has been peaceable for infantry. Our cavalry have gobbled a great many prisoners but the enemy have now only an observation force in our area about 15m off. The Reg't never is slim. I have an application here and at Albany to consolidate 174th with 162d. And the letter continues The idea of turning city Regiments into Cavalry is absurd The men are not used to horses and will not learn their management or care in 18 months. Country soldiers are used to horses. Signed by Colonel Lewis Benedict. 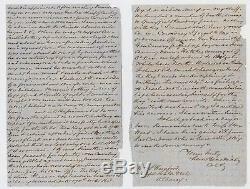 Scarce letter recounting what looks to be part of the Battle of Carrion Crow Bayou. Lewis Benedict (September 2, 1817 April 9, 1864) was a politician in New York State and later an American Civil War Union brevet brigadier general. Brevet Brigadier General Lewis Benedict, colonel of 162d regiment N. Fell in battle at Pleasant Hill, La. The 162nd, the "Third Metropolitan Guard, " was a New York city regiment, recruited under the auspices of the Metropolitan police. It left the state on Oct. 24, proceeded to Washington, whence it was ordered to Hampton Roads in November, and the following month embarked for New Orleans. It served for several weeks at New Orleans, Carrollton and Donaldsonville, La. During which period it was twice engaged at Plaquemine with small loss. As a part of Emory's (3d) division, 19th corps, it shared in the operations leading up to the investment of Port Hudson, taking part in the skirmish on the Clinton plank road, and being present at Fort Bisland, but without loss. Neville, was in the skirmish in April at Bayou Courtableau. In the 1st brigade, 2nd (Sherman's) division, 19th corps, it was actively engaged during the siege of Port Hudson, losing heavily in the general assaults of May 27 and June 14, its loss in killed and wounded aggregating 59, among the former being Maj. It was on detached service at Springfield landing in June and July, losing 10 killed and wounded in a skirmish on July 2. It was then assigned to the 1st brigade, 3d division, 19th corps, and was twice engaged at Vermilion bayou in the fall of 1863. In March, 1864, attached to the 3d brigade, 1st (Emory's) division, 19th corps, it started on Banks' Red River campaign, taking part in the battles of Sabine cross-roads, Pleasant Hill, Cane river crossing and Mansura. The regiment suffered severely at Pleasant Hill, where it lost 106 killed, wounded and missing. Benedict, commanding the brigade, was killed here while bravely leading a charge. The loss at Cane river crossing was 37 killed, wounded and missing. It accompanied Dwight's division of the Army of the Shenandoah to Washington in April, 1865, and a few weeks later sailed with it to Savannah, Ga.
Where the regiment was mustered out, commanded by Col. Its loss by death during service was 8 officers and 62 men killed and mortally wounded; 3 officers and 151 men died of disease and other causes, a total of 224. The item "Civil War Letter 1863 162nd NY General Lewis Benedict KIA Louisiana WAR CONTENT" is in sale since Thursday, November 29, 2018. This item is in the category "Collectibles\Militaria\Civil War (1861-65)\Original Period Items\Correspondence, Mail". The seller is "smithscastle" and is located in Circleville, Ohio. This item can be shipped to United States.